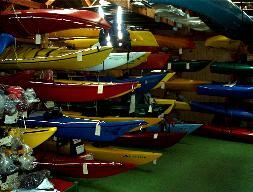 YES, we really have hundreds of kayaks... Over 8500 sq. ft. of indoor shopping displays. Enjoy our beautiful, natural Park-like setting. You can buy an imported kayak with a made-up brand name at the box store. Before you take it home realize that ...you can't buy parts for it, anywhere! ...you can't get a cockpit cover or spray skirt, because it is not designed to hold one. ...you can't buy a more comfortable seat, ...you can't make it go straight. The worst mistake you can make is to buy something that is so mediocre that you don't love it, you don't sell it, it just sits around and another year goes by where you miss out on enjoying nature in the way you dreamed. At Oak Orchard we believe in the Anti-Big Box store experience. We know kayaks. We enjoy kayaking. We like to help our customers have Fun on the water. We stand behind every new kayak we sell with in stock parts and service. If you have purchased a kayak elsewhere your warranty is through the factory. We warranty new kayaks that we sell to you. Shipping: we can ship most of our KAYAKS to you.....please call or email us for a quote. Click here for details. Sometimes you can tell just by looking; sleek fine lines, attention to detail, that extra effort it takes to be the best. Current Designs makes some of the best kayaks in the world from the highest grade of superlinear poly, fiberglass or Kevlar. Our customers are consistently impressed by the predictable handling and impressive glide of these fine kayaks. Current Designs makes fiberglass and Kevlar kayaks that are tough enough for streams and bumping into rocks along the shore! No need to be afraid of rocks like with those other brands. For our inventory see our "Kayak Inventory" page of our website. Dagger makes kayaks for almost every kind of water out there! Everything from whitewater to touring or general recreation...Dagger has a kayak for it! Eddyline is famous for top quality kayaks, their designs are legendary. Over ten years ago Eddyline ceased production of standard fiberglass and Kevlar kayaks in favor of tougher Carbonlite versions. 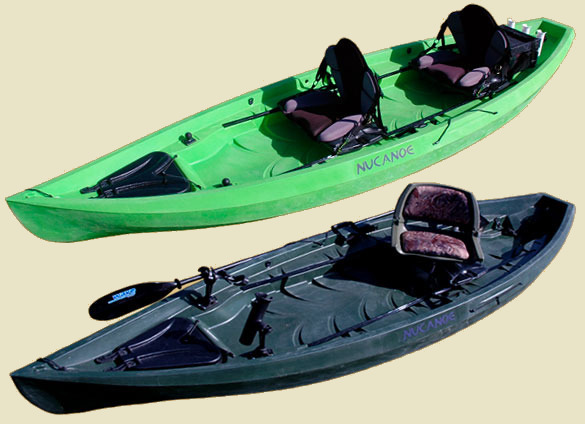 SEE our Jackson Kayak inventory click here... for the "Kayak Inventory" pages of our website. Known for their flawless "Hobie CAT" Sailboats, Hobie is the exclusive manufacturer of the HOBIE MIRAGE DRIVE! Added to an already great paddling sit on top kayak the Hobie drive really moves! You can go faster and further by pedal than with a paddle! Come Pedal one today at Oak Orchard. Want a kayak but you have no-place to store it? Innova has the kayak for you! Innova makes high quality, reasonably priced inflatable kayaks! These aren't like those cheesy inflatable pool toys sold at the big box stores! Call to order Safari, Helios or Swing, Swing II models. The super versatile "Safari" and the "Swing" are now available online. These are the new kids on the block. Ask about the Remix XP series. The folks at Native Watercraft are constantly exploring new opportunities to see what works. Materials used: Superlinear Polyethylene, or Fiberglass. Necky kayaks are especially a favorite of our customers that want to venture out in the choppy waters of the Finger lakes, Lake Erie and Ontario or the Niagara River and yet also be able to maneuver in Western New York's many small streams in the same kayak. Necky's unique designs are very versatile ! For recreation, touring, or in-between..... it's hard to outgrow a Necky. The Original and World leader in sit on top kayaks! click here to see some of our most popular models. The oldest most respected canoe manufacturer is now making some very fine kayaks. With models for beginners to intermediate paddlers. click here for more Old Town info. As one of Perception's first dealers we have seen it all. Let our experience guide you through your kayak purchase. We'll make sure your money is wisely spent on equipment that you not only own, but cherish. Walden kayaks are renoun for their stability. 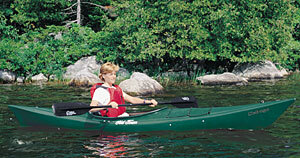 Walden Kayaks are friendly to the Environment since they are made from recycled HDPE plastic. 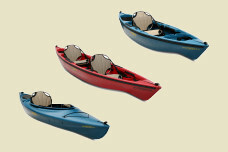 For our inventory see our "Kayak Inventory" pages of our website. Touring, Recreation and Sit on Top kayaks. You'll be sure to notice the tremendous improvements to Quality, Design, and Value in our NEW Wilderness Systems models. *Improved on-water performance -great tracking and stability. *Improved Seats -more comfort, more durable. *Better grade of Plastic -longer lasting, stronger. = More Value than ever before!